Firemen’s Park in the Prairie, or Sun Prairie Dream Park, was built in the summer of 2007 by hundreds of volunteers from Sun Prairie and surrounding in just 5 days and was spearheaded spearheaded by local residents Anita Holcomb and Rebecca Ketelsen under the guidance of Leathers & Associates out of Ithaca, New York. Today this non-city funded playground is maintained by a board of volunteers called the Friends of Firemen’s Park who work with the community to maintain the facilities. The Friends of Firemen’s Park Board meet 3 times a year and are always looking for new members and ideas! Watch our website and Facebook page for meeting announcements or send us a message to find out how you can join by clicking here. The Sun Prairie Dream Park is cleaned and maintained solely by volunteers! Please take a moment to go through our website and learn how you can give as little as an hour of your time and make a tremendous difference! A handicap accessible playground complex that includes slides, swings, monkey bars, “race cars,” and a climbing wall! 90-year-old Col. Wm. 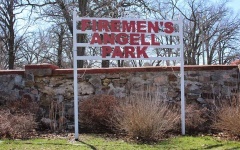 H. Angell donated a magnificent 13-acre piece of land to the Sun Prairie Volunteer Fire Department with the only restriction that it be open to the Sun Prairie community. Thus, was the birth of Angell Park. 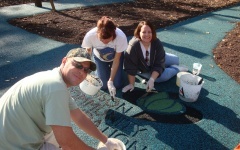 The dream park was spearheaded by local Sun Prairie residents Anita Holcomb and Rebecca Ketelsen under the guidance of Leathers & Associates. 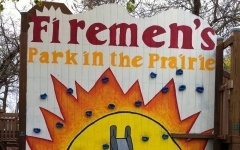 Over 3,000 Sun Prairie children provided input to create Fireman’s Park in the Prairie and more than 1,500 volunteers came together to help build the playground. 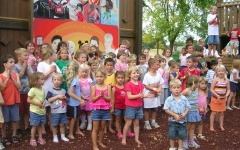 The park is now known throughout the community as the Sun Prairie Dream Park. The old building on the grounds was gutted and made into bathrooms. The parking lot and lighting around the playground was installed as well as the donor board which includes over 50 tiles commemorating Sun Prairie veterans who have given their lives for our freedom. Thanks to the help of Brian Brieske, Parks and Rec Forman for the City of Janesville, and his team of over 40 volunteers, the park received new rubber walkways. The same year, Tommy Sanders led the Sun Prairie High School Home Construction class on a project to build a storage shed for the park. The SkillsUSA kids and Tommy Sanders worked together to paint the Dream Park logo onto the playground climbing wall and install a donation canister. 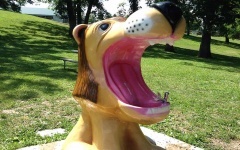 The Dream Park board purchased the Lion’s head bubbler. Water lines and concrete were installed and donated by Sun Prairie Utilities but the expertise of Dennis Allen and Tim Joyce are what keep Leo working and happy! The Dream Park board teamed up with Tree Health Management and devised a plan to maintain the beautiful trees around the playground. 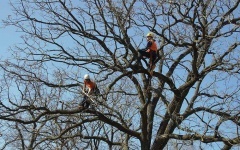 Investing over $2,000, all Ash trees were treated for Emerald Ash Borer and all trees were trimmed. Tree Health management in return donated over 10 trees and countless hours to the park. 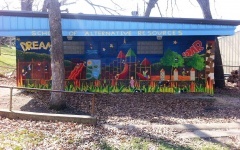 Thanks to a generous grant by the Exchange Club of Sun Prairie and Dane Arts Mural Arts, several artists worked with kids from Prairie Phoenix Academy to create the Pirate Ship Mural and Sun Prairie History Mural. Also in 2016, Haydn and Brady Nigro built a little free library at the park with their grandpa. 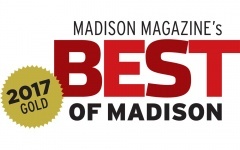 Sun Prairie Dream Park was named Madison Magazine’s Best of Madison gold winner for the best park.